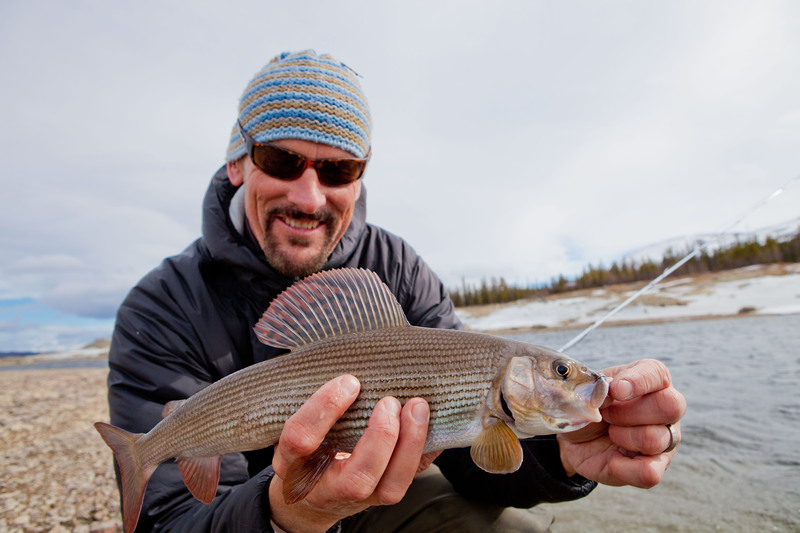 The season for grayling might appear just gray. But in the midst of the early spring grayness before the flowers bloom and the grass turns green there’s the grayling itself. Fins fluctuating in colors from silver, gray and black to most absurd purple and turquoise shades contrasting strongly to the lack of dye in the palette of early spring. When winter releases its grip on the waters of northern Sweden and the itch for the first casts and fish of the season is strong there’s the spawning of the grays. Most of the salmonoids spawn in autumn but grayling prefer early spring and are accessible when we need them the most. 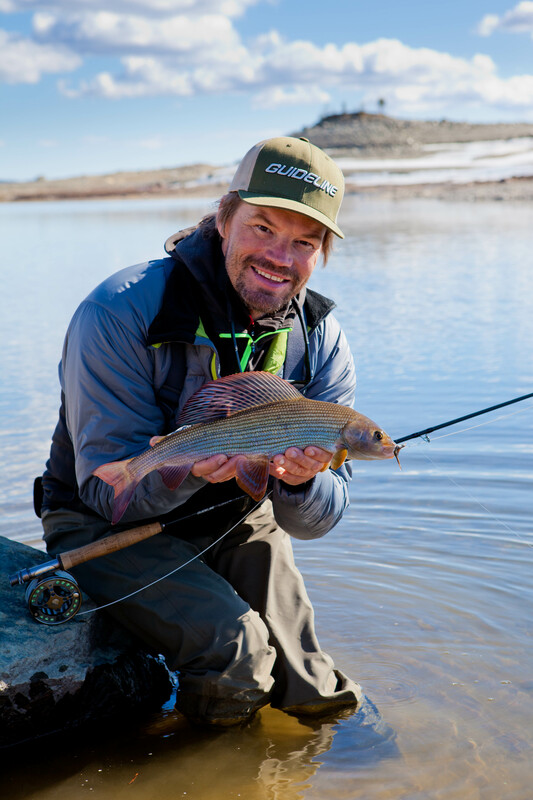 Fishing for grayling in early spring is not only a fun way to start the season it’s also one of the best times in the year to get in contact with the bigger ones. 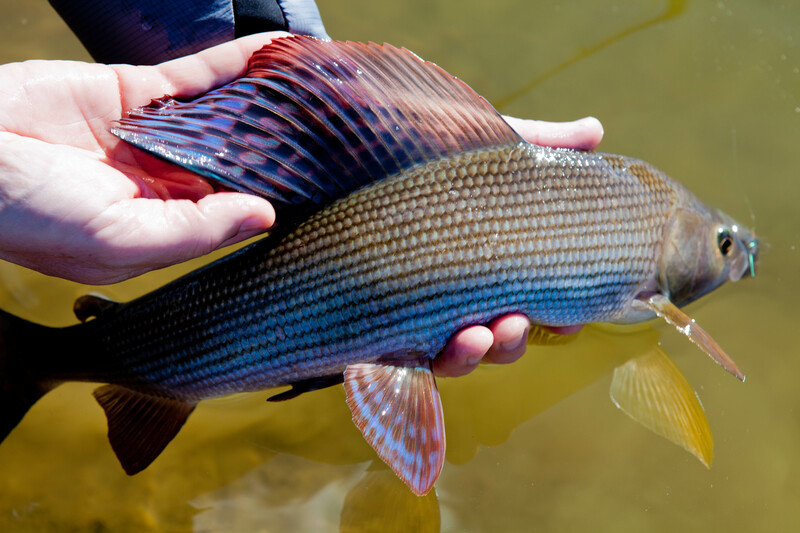 Grayling spawn in temperatures varying between three and eleven degrees Celsius. In Sweden this happens some time in March until June depending on where you are. It normally happens right after the ice disappears. From a fly fisherman’s perspective you need to be ready because the big fish arrives first, first the big males and then the females. Low water temperatures means, as it normally does, slow moving fish that stay deep. Sinking lines might work well under certain circumstances but the slow moving water were the fish are, even though deep, might be impossible to fish because the sinking line sinks all the way to the bottom and snags. A sink tip works better but I prefer a floating line in combination with Airflo polyleaders of varying sinking rates. A floating line and a short polyleader work great together, particularly in slow moving water. 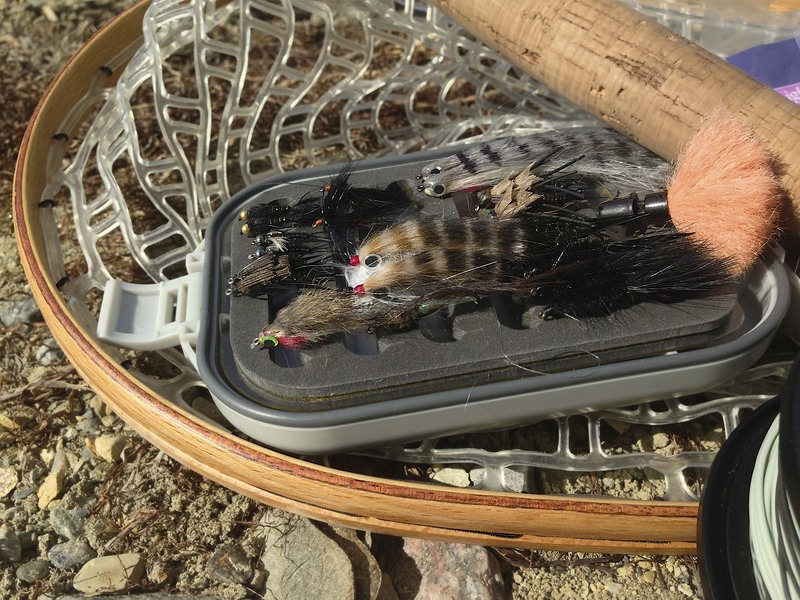 With this setup you can fish pretty deep, still get the fly moving and have great contact with the fly. 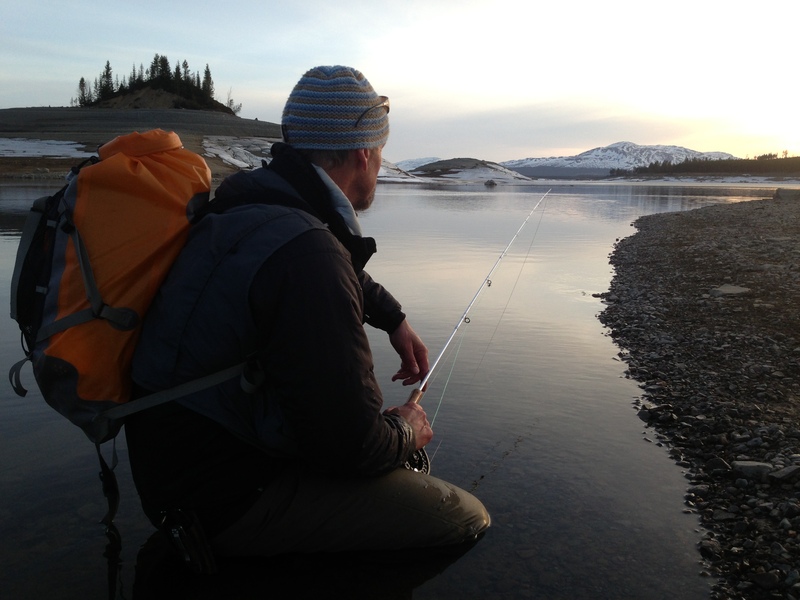 Place the casts 90 degrees or even upstream depending on the depth of the water. Let the current form the line in a nice and even arc. 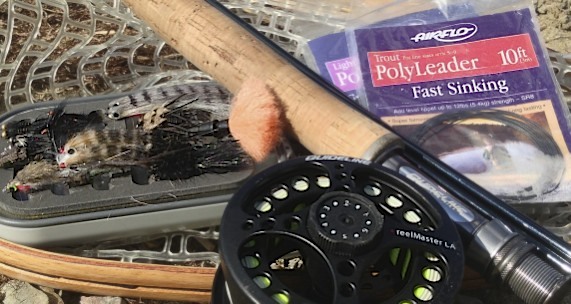 If you need to get even deeper you can of course use a heavier fly but many times it’s enough to release some line and give the fly a little more time to get down. Let the current fish the fly for you, the slower the better. The fly should start to fish just above the bottom and stay for as long as possible at depth. If the water has a little turbulence a slow hand twist might help you to keep in contact with the fly. But stripping the fly to fast normally result in the slow moving fish ignoring it. A little backbone to the rod does the trick when using polyleaders. A nine-foot LPXe or Exceed class six rod is the perfect choice. Regarding flies its quite simple. After a long winter grayling are in surprisingly good shape but they are always hungry for an easy to grab meal. Stonefly imitations work well, but fish-like patterns with a lot of movement in them work even better for the bigger ones. Rabbit zonkers and marabou creations work well. SSS Angel hair in color pearl makes up for the right fishy appearance. Black is a good base color but when spawning comes closer flies with purple and turquoise additions might be worth trying out as the grayling gets more and more territorial. Enjoy the gray part of spring! Those are some great catches that you guys got there! Good fishing! Oh wow! What a nice pictures. Great fishing. I loved it.